When I heard that the city of Detroit had filed for Chapter 9 bankruptcy – the largest city ever to do so – my assumption was it was the slowdown in the auto industry and out-sourcing of jobs that had done in the city. But that’s not the extent of it. As with personal bankruptcy, people make assumptions about why they happen such as careless spending or bad money habits, but this is usually not the whole story. And with the Detroit bankruptcy, the truth is more complicated. Here’s the five shocking problems that caused the Detroit bankruptcy. #1 Corruption Detroit Mayor Kwame Kilpatrick was found guilty in March of a roster of corruption charges. Rather than trying to help the city, Kilpatrick was busy enriching himself while allowing the city’s decline to continue and worsen under his regime. While the city’s funds ebbed away, Kilpatrick’s personal expenditures increased. The “Player Mayor” used public funds and grants to pay for his bling lifestyle, so it’s no surprise that bankruptcy came so soon after his tenure. #2 Bank Shenanigans Detroit has lost hundreds of millions of dollars to rate swap agreements to banks. A rate swap is when a bank promises to protect you from interest rate increases on a financing arrangement. What they don’t tell borrowers is that if interest rates drop, you pay a huge financial penalty. Detroit owes Wall Street $344 million in unnecessary fees from being taken advantage of in poorly structured debt agreements. #3 Destructive Debt Detroit’s debts are estimated to be between $18-$20 billion – roughly five times higher than any other city that’s ever filed for bankruptcy. In addition to the hundreds of millions they owe for setting up rate swap agreements, all of their operations are funded by debt. Even if the city had access to all of its revenues, they couldn’t pay off their debts in 20 years. They’ve got a Great Wall of China of debt they’ve built up and the city is crumbling within it. 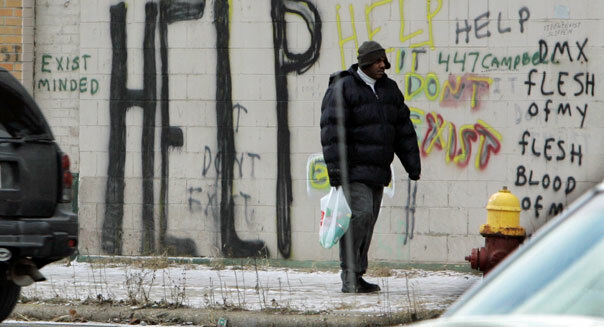 #4 Shrinking Tax Base The debt dilemma Detroit has been under has meant a terrible decline in public services. Trash doesn’t get picked up regularly, police don’t respond to calls and crimes go unsolved. Because of these conditions, any that can afford to flee have done so. 78,000 homes and buildings sit abandoned – structures that once contributed to the tax base of the city. As more people flee, there’s less revenue to pay for services and the city will continue to suffer. #5 Unreasonable Expectations Detroit owes roughly $10 billion (half of its debt load) in pensions and pension related services such as medical insurance and other benefits for retirees. These are arrangements that were made when Detroit was cash flush and king of the worldwide auto manufacturing market. But retirees expect their generous benefits to continue even when many have fled the city and are no longer part of the tax base that supports their benefits. What Lessons Can You Learn from Detroit? Make good money decisions for your whole family rather than indulging yourself in what you want. In other words, rather than buying yourself an expensive handbag or electronic gadget you don’t need, instead use that money for savings or paying off debt. Don’t take on bad investments. Subprime credit cards, subprime mortgage, high interest store credit cards and payday loans are all examples of financial arrangements that are really bad for you and take advantage. Avoid these bad deals that will drive up debt. Pay cash whenever you can and don’t incur debt. If you can’t afford to pay cash for something, you really can’t afford it. Only charge on your cards what you can pay off each month (or better yet don’t use them at all). Save up for bigger expenses rather than incurring debt. Don’t take on debt that can only be supported at your current income level because you could lose your job or suffer a career setback. When you get raises, try not to increase your spending to eat up that extra income. That way, if your income rises, you’ll have more security. If you do have a financial setback, adjust your spending immediately. You may recover soon, but in case it goes on longer than you thought, you won’t be digging yourself in deeper until your debt is unmanageable and bankruptcy is unavoidable. If you are already in an untenable debt situation and want to find out if a chapter 7 or chapter 11 bankruptcy can help you, contact the law offices of John T Orcutt for a free consultation at one of our convenient locations. Contact us now for help!